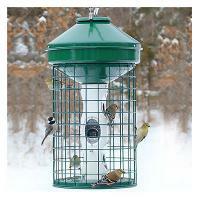 We love this caged feeder and would of rated it as 5 of 5 stars but there is one small issue that we had with it. The blackbirds can get at the seed thru the 2 bottom layers of the wire cage structure,chasing off the small birds. We fixed this by taking some poly or plastic standard mesh from a piece of yard fencing(not chicken wire), cutting it to size and weaving it thru the bottom 2 layers of the cage. The blackbirds have tried, and tried without success and have now basically left it alone, no longer bothering the small birds. 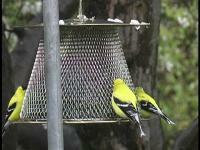 Also, the small birds could care less about the mesh addition and are now happy campers. I would highly recommend this design change to the structure of the cage. But of course that is up to Backyard Chirper. Thanks for a great product. 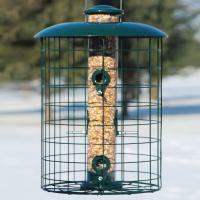 It is effective in preventing squirrels from getting the food. 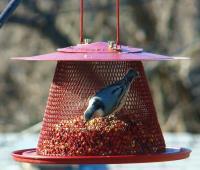 It is difficult to use a funnel to fill the feeder. There is only one drawback. I had to use wire to make a cris-cross pattern on the bottom two rows of openings otherwise the larger birds would hang on the outside, flapping their wings while they fed off the bottom tray, scaring the smaller birds away.